Killybegs is a town in County Donegal, Ireland. 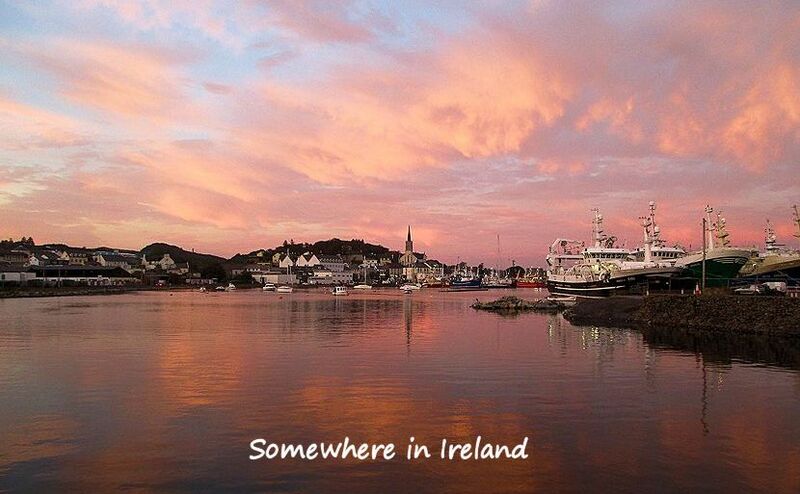 It is the largest fishing port in the county and on the island of Ireland. I have learned that Monday is another bank holiday here. I am not sure whether this means that the library will be closed on Saturday as they were last bank holiday weekend or whether that was specific to the Easter bank holiday. In any case, here are some odds and ends to end the week. It is a good thing that Bill and I have been losing it in tag team style. When we first arrived and started having all of these hassles, I was the one who was miserable and angry. I’d had enough of the process and just wanted to start living my boring, quiet life again. I was tired of scheduling my days around the opening hours of the library. I was tired of the need to go there, come home and charge the battery, and go back so Bill could work on stuff. I was tired of everything taking so much longer than it needed to take because we do not have internet access--everything is more complicated. I was sick of the whole thing. Then I read about stuff and learned about the nonsensical things that have happened in the past and it all started to make sense. Even the weird questions we got at the bank become understandable when you learn--as Bill did in a book he was reading about scandals in Ireland--that once upon a time, some guy in the government made it so that if people “invested” enough money, they could have an Irish passport. Many of the people who did so were from the Middle East. Now the questions the woman at the bank had to answer about whether we were from a risky country or even a high risk country and whether she was doing this as a face-to-face encounter make perfect sense. There is a woman who lives around here--down the street from us somewhere--who wears the coolest headscarf. I love it! The first time we saw her, we were looking out the sitting room window and saw her walking down the street pushing a stroller. She was in the shade and then she walked into the sunshine and all the little spangly things hanging from the black fabric burst into rainbows from her head. We saw her again yesterday when we were out and about. Anyway, I have settled into a mindset of “it is what it is and I can’t change it.” I have accepted things and it doesn’t really matter that I don’t like it. I don’t like a lot of things and who cares? So I go through my days and enjoy the moments when I am at home and not dealing with foolishness. I also try to remember that we have done pretty well with the things we can control. We tried contacting people about places to rent before we left Maine and got no replies. When we got here, we regrouped and figured out a way to get a nice place by the time our BnB week was done. We do what we can and I try to let go of the things that are out of my control. But Bill is getting a bit more pissed off every day. He is really starting to get stressed over things not happening. So when I was losing it and not functioning well, he was there to encourage and move us along. Now that he’s not doing so well, it’s my turn to point out the bright side! I woke up this morning and went into the extra room to get the dry laundry put away and open the window. It was brisk! Yay! I was thrilled about the grey skies and brisk breeze, but I shut the window because I figured Bill would be cold. I did open the kitchen window for a few minutes, though, to let some fresh air in. It’s been sunny and in the mid 60s for the past couple of days--too warm and stuffy for me! We are having duvet issues! Duvets are the thing here. When we looked at and bought sheet sets, they came with the fitted sheet complete with bottom ruffle, 2 pillowcases, and a duvet cover. This makes perfect sense and I like the duvet concept. You have the middle quilted part and then the big cover and you stuff the quilted part in the cover like a pillow in a pillowcase. The cover snaps closed at the bottom. You can take the cover off and change it and you can get flannel sheets/covers. It’s a great idea and necessary, too--no way I’d ever be able to fit any kind of blanket or quilt in my washing machine and laundromats are few and far between. Anyway, because Bill is always cold, one duvet for the bed was not enough for him (mind you, with all the layers, it’s like having two sheets and a quilt). We had to get the duvet from the spare room and put that on the bed, too. Sigh. There have been many days in the three weeks we’ve lived here where it’s been chilly in the apartment and I have appreciated the duvets on the bed when I first climb under them. I even love the weight of them--I hate it in summer when I’d have just a sheet--not enough weight for me to sleep well! But I wake up roasting every morning. If I flip one or both of the duvets off of me to get some air, Bill says it’s too much on him. I have no idea what we will do to solve our duvet dilemma. It’s getting warmer now, so I am hopeful that one duvet and maybe an empty cover would be enough for him. He gets cold easily since he started taking the coumadin. I do think we may have to get a king size duvet/cover for winter because the full size ones are not wide enough. We had a good system in Maine--we each had our own pile of blankets and could add or subtract as necessary. We will need to think creatively and see what we can come up with! The post office in Brunswick forwarded our mail. Before we left, we had them hold it and we sent the change of address form back to them a couple of weeks ago. We were unsure which address to use, as we seem to have 3 that will work. We decided to use the same one that was on a letter left by the previous tenant. It was from the TV license people telling him that there was evidence of a TV in the home, but he’d not gotten his license (it costs 160 euro a year unless you’re an elder, in which case you get it free--yet another reason to be glad we’re not TV people). There is a different address used by the all-important electric company, which is the one the bank has. So we got mail from the bank and from the USPS in our box at the same time and there were different addresses used by each institution--LOL. We could also apparently use a combination of the two, which is how the address appears on the lease. Guess we can choose one or another depending on mood. The RTE Radio 1 Book on 1 this week is The Land of Decoration by Grace McLean (MacLean?). I am enjoying it--such a nice bright spot in my day! Tonight Miscellany is on before the book--I caught the last 15 minutes last week and wished I’d heard the whole show--it seems to be writing specifically for radio and there are several pieces in the hour. I’ll be tuning in at 10 tonight with my crocheting! Last night I finished a book called Coming Home. Bill had found it at the library and read it first. It was a collection of life stories of people who had left Ireland when they were younger and came back to live as elders. There’s a program--or at least there was--that assists them. It was quite helpful for us to read about their experiences--having lived elsewhere, they seemed to have many of the same frustrations as we do upon their return. Several of them knew someone who’d come back and then left again because they couldn’t stand it. They mostly came back during the Celtic Tiger years. I wonder what they thought when all of that collapsed. They’d grown up in and left a poor country, came back during a boom, and then there was a bust again. I have some novels to choose from for my weekend reading. 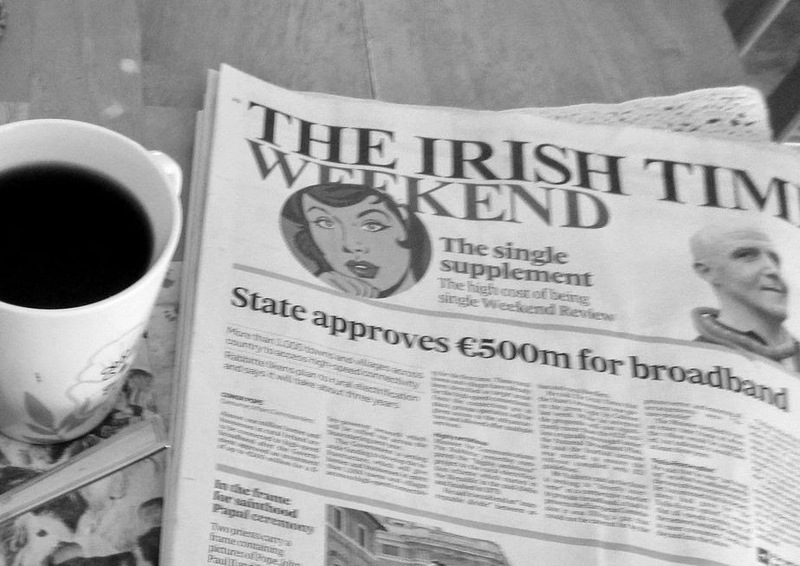 On Saturday we will pick up the Weekend Irish Times and save it for Sunday. It has been years since we spent hours reading a Sunday paper, but we find that there is a lot of stuff to read in the Times. Bill emailed the woman from the stroke support group and she called him within a few hours. She told him what steps he would have to take. He has a list of doctors now so can start making phone calls. That was the one thing this week where some incremental progress was made. It’s a step in the right direction, anyway. Everything else remains as it was, except that I feel better and Bill feels worse. I am settling in and he is starting to resist. It might not be the right time to remind him that attachment to a particular outcome leads to suffering, so I’ll just keep reminding myself!